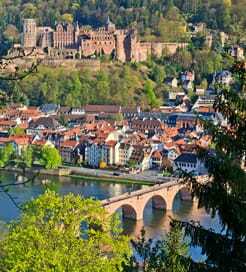 There are 2 ferry routes operating between Germany and Lithuania offering you combined total of 8 sailings per week. TT Line operates 1 route, Rostock to Klaipeda which runs 1 time weekly. DFDS Seaways operates 1 route, Kiel to Klaipeda which runs 7 times weekly. As the frequency and duration of crossings on some routes varies we would advise that you do a live search for crossings from Germany to Lithuania to get the most up to date information. Lithuania is the southernmost of the Baltic States in Northern Europe, with a short coastline on the Baltic Sea. Gaining independence from Russia after the First World War, Lithuania has since flourished, with an increasing number of tourists unearthing its natural splendour and marvellous cities. Lithuanian landscapes consist primarily of undulating hills, lush forests, glistening lakes and meandering rivers. The coastline, albeit small, is beautiful, and the UNESCO World Heritage-listed Curonian Spit, a thin stretch of silver sand, tops the list of Baltic beaches. 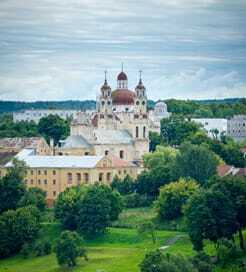 The capital is Vilnius, an eastern city characterised by beautiful baroque buildings, cobbled alleyways, endless church steeples and one of the largest Old Towns in Europe. Also, standing elegantly between the Neris and Vilnia rivers, it’s an artist’s dream. Ferries from a couple of European countries sail across the Baltic Sea to the Lithuanian city of Klaipeda. Regular long-haul crossings are available, so be sure to book some comfortable accommodation.